I hope you are having a wonderful week. I am at home this week and finding it so hard to get motivation to do anything, be it work or blog. I would like to tell how much I respect those who work at home and blog at the same time. It needs a solid planning and merciless execution. In my case I am also feeling a little tired from last semester so I would like to give me a few days off too but I know my time is running out to get ready for the next one, then the blog *cries* I end up doing nothing. My current challenge is: I am at home, why would I do make-up? Haha! I mean there are so many bloggers who make-up for the blog, I know. 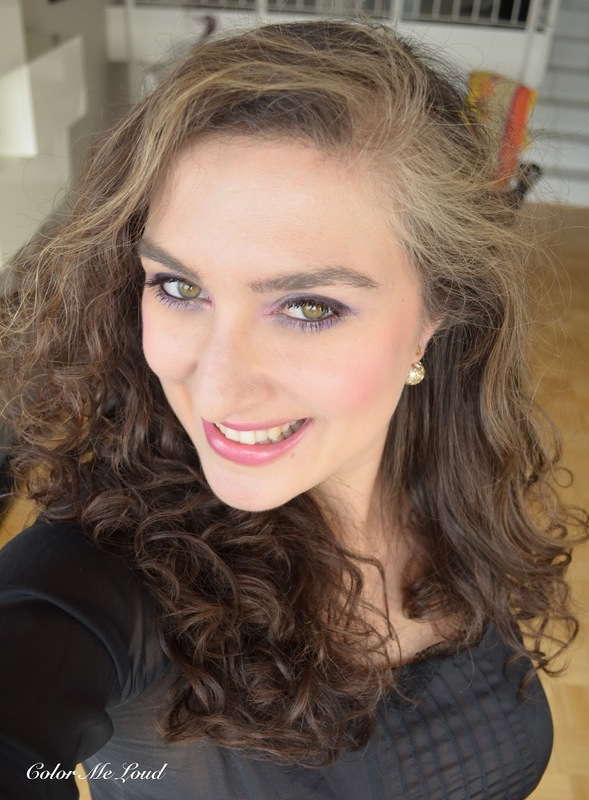 But I only make-up because I go out and blog as a side-effect if you want to call that so here we need a chance. 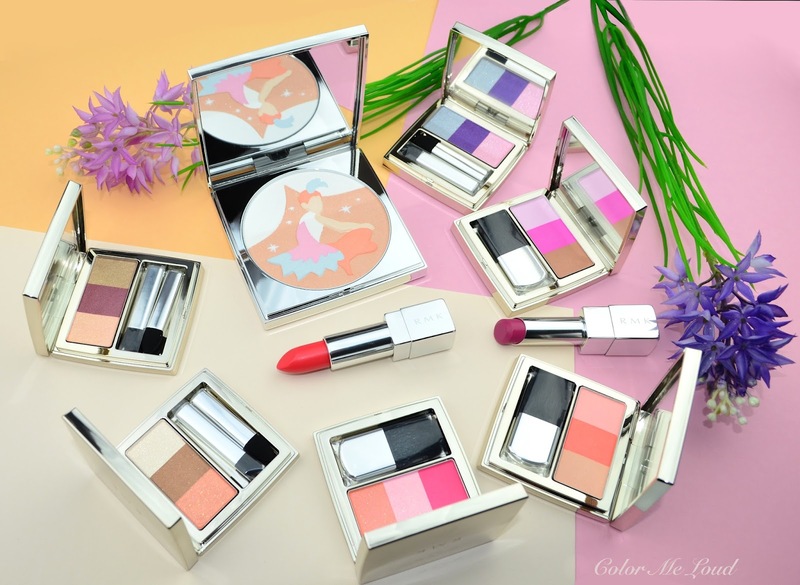 Today's post is about RMK Color Performance Spring Summer 2016 Collection. I sincerely think RMK is one of the most under rated brands in Europe. Once you go to Japan, you see all the counters they have in almost all department stores all around the country and how these are selling like hotcakes. I wonder when the hype will reach here. For those of you who like a bit of make-up adventure, you can get the brand online at Selfridges, Beautybay and Lookfantastic, last two have free shipping too. I recommend you to try a few of their products, especially their blushes and glowing lipsticks (four of them reviewed here) are fab. Blushes have one of my all time favorite formula. Their base products (e.g. one review here) seriously rock too. When I was traveling to Berlin last week, I only took RMK Spring Collection with me and took them out to play! Without further ado, let me show you these gorgeous trios, stunning face palette and some lippies. 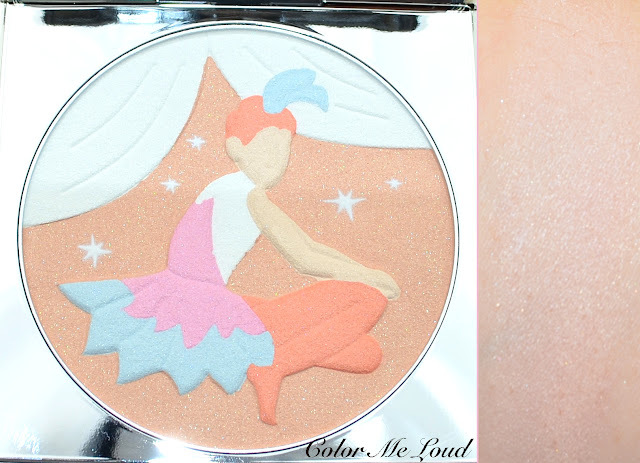 The star of the collection is RMK Spring Circus Face Color. This has a stunning design and a generous size of 21 g powder. After the first use the stars disappear but the design is preserved. RMK offers type of detail you would expect from Japanese cosmetics, the plastic inlay of the Face Palette have the stars printed so even after the first use, you can enjoy them. RMK Spring Circus Face Palette looks to be bronzy but it is not. It has a similar idea to Guerlain's Meteorites (the latest reviewed here). This powder blurs the imperfections and gives a slight sheen to the complexion while setting any cream products underneath. Although it looks scarily bronze in the compact, once swatched, it is a great match for my NC20 complexion with neutral undertones. I love using this all over my face. It is talc based but also has silica listed, so it is a lightweight formula. It doesn't look powdery on my dry skin. Loving this one, but it looks to be sold out online. Your only bet can be someone you know from Japan or London. 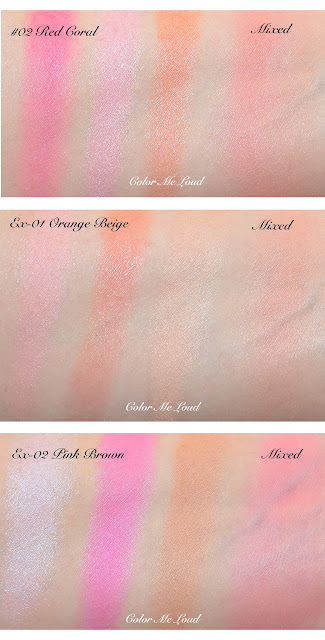 Here are some swatches of RMK Color Performance Cheeks for your reference. I swatched the shades one by one since some of these shades can be used to contour or highlight by using an eye crease brush. I like using the first shade on Ex-02 as a highlighter and the last one as a subtle contour but most commonly I swipe my brush on all the shades at once to apply on the cheeks. #02 Red Coral: This has a reddish pink, a neutral rose and an orangy coral. All mixed together it makes a beautiful coral with a gorgeous sheen. This is very pigmented and will show up on light and medium skin tones well. Ex-01 Orange Beige: The shades in this one are closer to each other so I usually use them mixed together. This one is also the subtlest blush I have but shows well on my cheeks. I believe though if you are deeper than NC25, it might not show up on you. Mixed together it is a orangy coral with a pink sheen flashing through. Ex-02 Pink Brown: This is the coolest of the shades I picked up. If you concentrate your blush on the left side of the blusher, you get a very cool pink and some highlight mixed with that. It is gorgeous since also the highlight works beautifully once applied with an eyeshadow brush. All mixed together gives a more neutral pink. 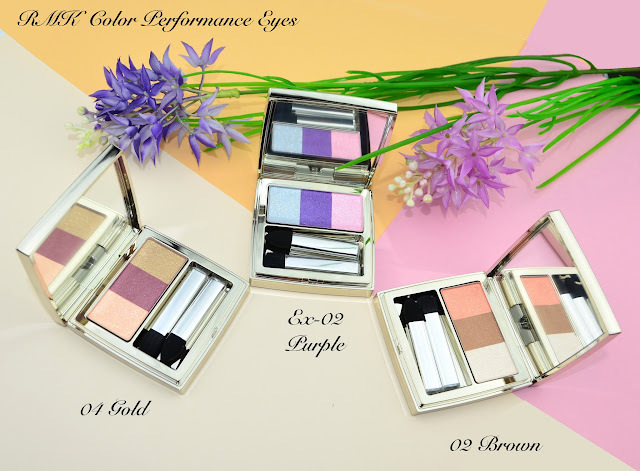 Now about trios RMK Color Performance Eyes, I am a little torn. They are all very nicely pigmented and have a gorgeous sparkly finish which plays with the light beautifully on the eyes, like diamond dust. I had a bit of a fall out during the day because of these fine glitter though and the colors faded a little. They swatch very pigmented but on the eyes they have a bit of translucency which makes them very wearable. I am deeply in love with #04 Gold and Ex-02 Purple, both of which you will see me wearing at the end of this post. I think the first shade has the glitter so has to be applied more sparingly. I was going a bit over board with that so ended up with some glitter under the eyes. It is not as bad as what I have from Tom Ford's say Disco Dust (reviewed here) but I have a low tolerance when it comes to fall out. Also know that things fall out on me more since my eye lids are dry and doesn't hold glitter well. Maybe I should go for a glitter glue from time to time. 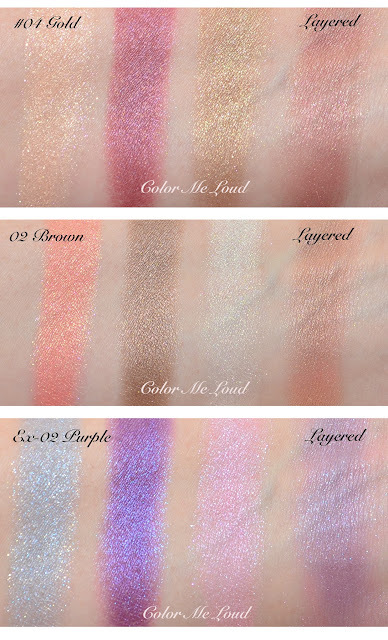 Here are some swatches of RMK Color Performance Eyes. Since the shades are not separated, you can swipe your brush on all the shades and get the layered shade to use as a mono, I included these in my swatches on the right most. You can also mix the neighboring shades. #04 Gold is a gorgeous combination of gold, light peach and plum. It is a warm plum trio and the gold shade is not too yellow but leans more green. If I were to pick just one, this would be it. It combines so well with the coral cheeks and coral lips. Eyes all heart! #02 Brown is a combination of peach, ivory and khaki. This one is the most understated of all three, has also less glitter (therefore less fall out for me). 02 Brown is a great swipe and go fresh polished look trios, would especially look stunning on blue eyes. Ex-02 Purple is a cool purple pink and silver combination. Silver is not too cool and wearable. The purple in the middle is just gorgeous. I must own hundreds of purples but I don't own something like this. I want to bath in this shade! Big love despite some silver fall out. I am also a big fan of RMK's recently released lipstick formula. I am mostly drawn to Irresistible Glow Lips, which are sheered but this time around RMK Irresistible Bright Lips in Ex-06 stole my heart. 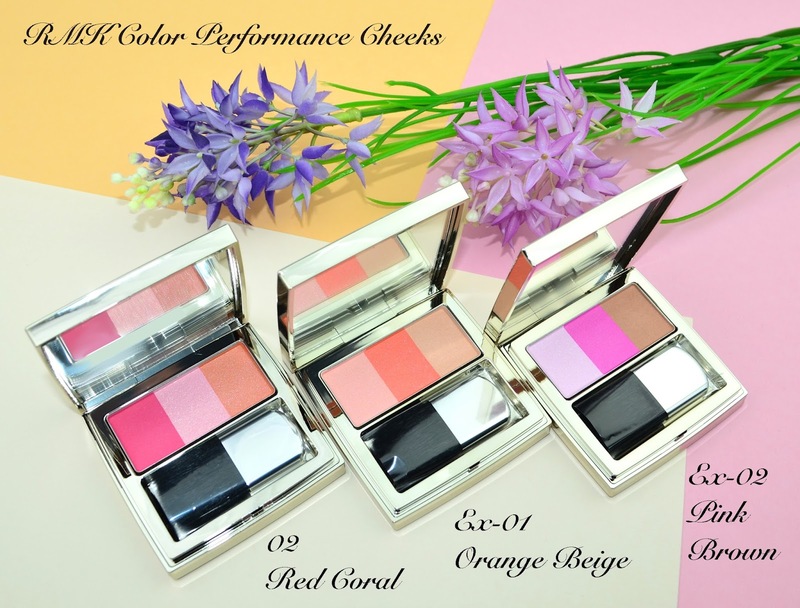 I am very fond of both of the shades but Ex-06 gives me the right amount of coral peach and pink, it is the shade I was looking for this spring and already made its way into my purse. These are very hydrating and they have good lasting powder. Bright Lips are more pigmented therefore also stay longer on the lips. Now onto looks. I have worn these for weeks now and over many occasions but I wouldn't like to make this already long post even longer so I will include some other FOTDs in a separate post or integrate them into the upcoming posts. I would like to present you two FOTDs, one warm and one cool. Let's start with the warm one. I am wearing RMK Color Performance #04 Gold on my eyes. I have the peach in the inner corner, gold in the middle and plum on the outer corner. I completed the look with RMK Color Performance Cheeks #02 Red Coral on the cheeks and Irresistible Bright Lips Ex-06 on the lips. Here is another look with eyes open. 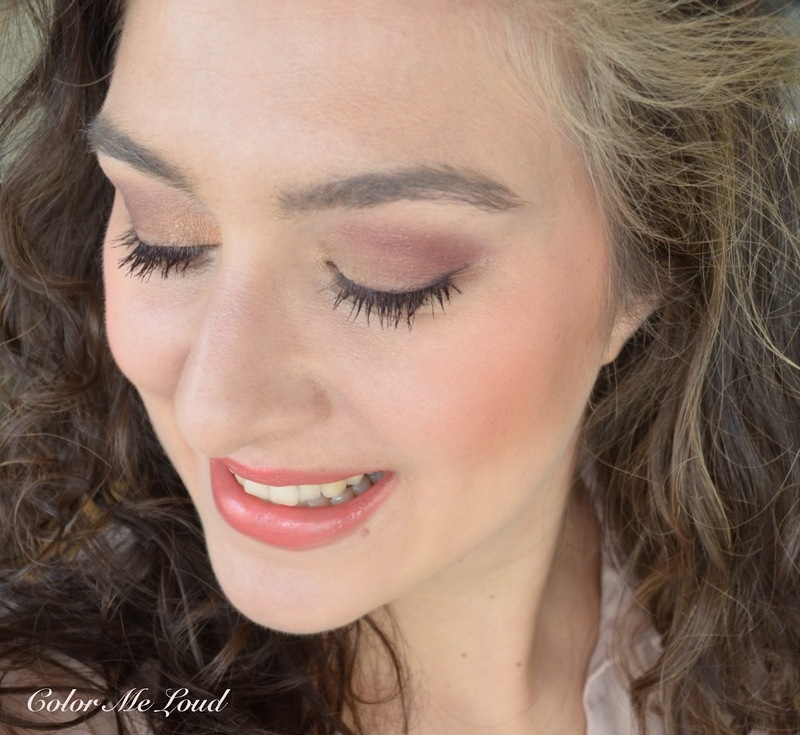 I love how the blush brings pink and plum to coral by mixing both of these on the cheeks. I applied the pink shade also as a highlighter on top of the cheeks. If you have a similar coloring to me, you will find this combination to be very flattering. Now on to some cooler shades, I am wearing RMK Color Performance Eyes Ex-02 Purple on my eyes, RMK Spring Circus Face Color all over the face, RMK Color Performance Cheeks Ex-02 Pink Brown on the cheeks and as a highlight and contour as well. On my lips I have Irresistible Bright Lips Ex-09 to compliment the cool tones. And have you noticed my earring? This is the one I picked up at Dior Store in Berlin, loving it at the moment. For me both of the lipsticks are so much love. The collection combines so well with each other. There are also some green and mint options for those of you who like these shades. Definitely worth checking out. 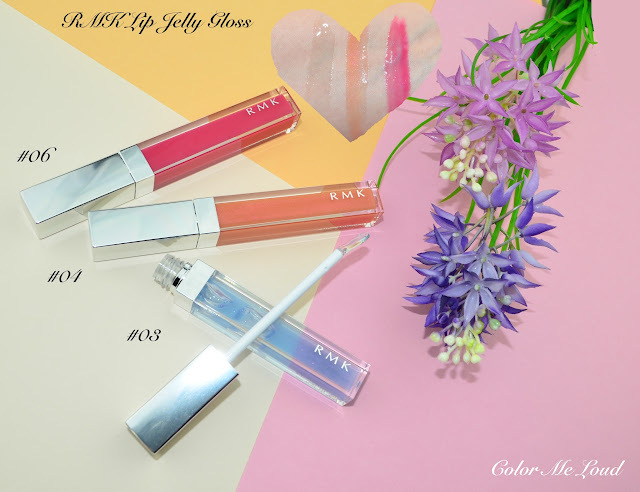 Before I finish for today, these are three of the new RMK Lip Jelly Glosses which were released earlier this year. I was expecting to write a review at the end of last year but the package with those in them never arrived from UK because there was a nail polish inside. How lethal! I am still very angry at Royal Mail for this. Anyway RMK team was so nice and sent me three of these again for me to test. I will put on more FOTDs in the upcoming reviews but I really love how these feel although I am not a gloss girl. They feel very hydrating and the slippery (but non sticky) feeling is there for a long time. They have a plastic applicator which is new to me but works perfectly. The blue one is sold out everywhere at the moment but they are expecting a restock. You put a dab of it over your lipstick to make your teeth look whiter. The pink one has most of the pigment. Final thoughts: Another solid collection from one of my favorite Japanese Make-Up Brand, RMK. Love their vivid colors and gorgeous textures. These combine so well for a colorful make-up look which is fun but not over the top. I think must haves are the two lipsticks Ex-06 and Ex-09 as well as the Spring Circus Face Color and the blushes! Give me all the blushes, these have a very naturally lit within finish and very long lasting power. Big thumbs up. Have you tried anything from RMK? Any recommendations? These trios! After seeing them on your instagram, I already checked 02 and 04 online. Now I am confident in them:) Beautiful and don't cost a fortune. 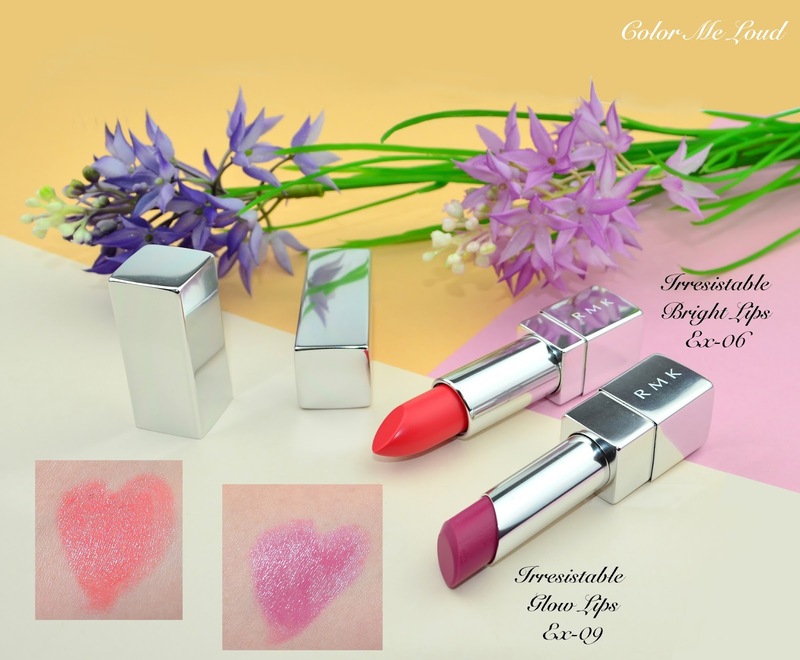 I want to try a sheer lipstick but have a lipstick traffic jam - did not try or even unpack most of the new lipsticks, too many already, so if I buy it, I will maybe apply it once this year ( but I keep them in mind, looks like a good alternative to Suqqu prisewise. Those blushes!! I just ordered two-- the red coral and the pink brown. I also have the problem of the disappearing blush. It's why I always say -- clown cheeks? bring them on! Better than TF? High praise indeed and the cool and warm trio format makes it great for us neutral girls. I adore the purple eye shadow but what with some recent purple shadow orders (coughs) I cannot justify it right now. The face powder is really cute ! 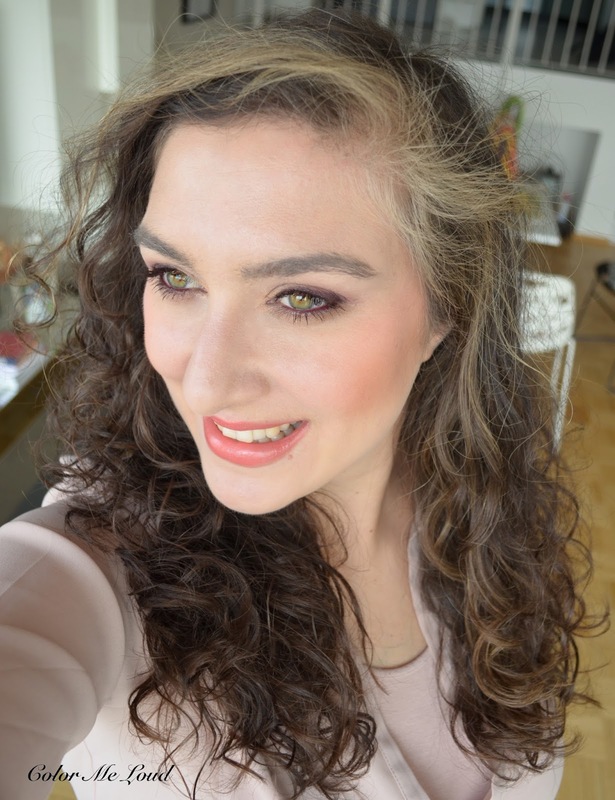 The red blush, and the eyeshadows gold and brown are my fav... And Lipsticks look great too ! Oh stop, Sara, with the gorgeous posts! You are making me salivate over everything you've featured lately. I so wish RMK was available in North America because that face palette is so cute! I might have to ask someone I know from Japan to pick it up for me! And those blushes, amazing colors! I think for the price RMK Make-Up Line offers great quality. Especially comparing to what we could get from western brands, this is almost too good :-) I can't wait to her what you think of 02 and 04, please let me know after trying them out. you picked up the right ones, I am loving them both, like big love! Cant wait to hear what you think. Those stay all day on me, without fading, I hope it has the same effect on you. Please write back and let me know. 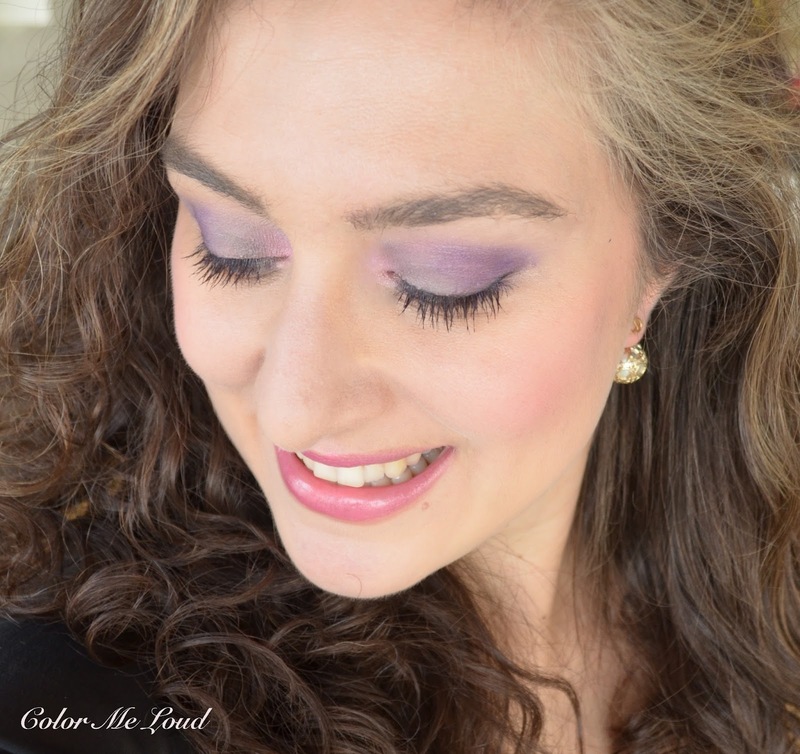 I know what you mean about purple eyeshadows hahaha! Face Powder is so stunning, red blush kills it and gold eye shadow, OMG! I will Check in I can order these two blush baby's tomorrow. Sara made me buy it lol! LOL, you will love them. Beauty bay sends it for free, check out for some discount coupon online too, they frequently offer some. Aaahhhh these are really soooo nice!!! I'm in love with the colors!!! I still can't bear to dip my brush into the face powder, and nooooo I don't want my stars disappearing!! Hahahaa..... it may just end up in makeup museum! LOL!! HOW ARE YOU GETTING YOUR REVIEWS OUT?!?? I'm just so behind lately and idky! LOL yes the stars disappear with the first use but good new is that everything else stays the same :-) You should really use it, it is a lovely powder. Hahaha about the museum lol. I am also behind, have a list of 30 reviews I have yet to do, it is frustrating. Limited editions always have priority and some wait in the queue for so long now. Ah, 04 is sold out on beautybay after your review! :) I moved to the US few days ago so was waiting to order it here. I am waitng for it to be re-stocked, so I can buy them both 02 and 04. A popular shade indeed! I don't know if these are really connected but after I reviewed the RMK Fall collection last year, all the shades which were reviewed were out of stock in a day or two. I think there are really so little reviews for RMK out there in English and too less counters so we all order online based on swatches. 04 is really gorgeous, hope you find it Xox.